On a recent trip to New York City, I stumbled upon a great wine bar - or should I say Champagne bar: Flute. There are two New York locations and I found the midtown one located on W. 54th street, between 6th Ave and Broadway. The goal of this establishment is to provide "a comfortable space where guests could have a "Champagne experience" whether they came for caviar and bubbly or cocktails with friends." I think they succeeded. I arrived promptly at 5:00 PM, right when they opened and thus I had the tasting bar to myself - plus another couple starting their Saturday evening. Flute serves 100 champagne and sparkling wines by the bottle with about a dozen of these available by the flute. You can also purchase tasting flights of various champagne and champagne cocktails. I started with a flute of the Chartogne-Taillet Rosé NV - a dry champagne made from 65% Pinot Noir and 35% Chardonnay, plus a splash of Pinot Meunier. The wine has strawberry flavors and a dry - complex finish. I can't wait to step up and try their Cuvee Fiacre. I wanted to also try a French sparkling wine, so the bartender recommended the Blanquette de Limoux Grande Reserve, a dry champagne from southern France's Languedoc and the home of the first sparkling wines. This wine was lighter than the Chartogne-Taillet and balanced throughout, a very drinkable champagne. It is made from the Mauzac grape, known locally as “Blanquette” and the name of the appellation: Blanquette de Limoux. I would suggest this wine before a meal and the Chartogne-Taillet during. "This wine’s deep dark color is notable for Sangiovese. The promises made by its appearance are kept by the aromas and flavors of this dark rich wine. The nose brings aromas of black fruit and well-integrated oak with a hint of licorice. Warm rich flavors of jammy blackberry and juicy cherry are accompanied by soft tannins and a subtle note of mint on the finish." In layman's terms this is a fruity wine, but with a smooth - slightly spicy finish. Even with the low tannins the finish is unique. This morning I discovered that the wine won Best of California and Double Gold Medal at the 2007 California State Fair Commercial Wine Competition and various other Gold and Silver medals during the past year. The wine is also very reasonably priced at $20. I hope I can find another bottle in my area. A short while ago, one of our local wine merchants, Norm's Beer & Wine, suggested a bottle of the 2003 Antis Malbec. We have been back several times to restock. Antis is another term for the Andes Mountains and this wine is made from 60 to 90 year old vines grown on the foothills of these mountains. The wine is composed of 92% Malbec and 8% Cabernet Sauvignon and aged in different oak combinations. The result is a dark purple wine - with strong fruit flavors - and a slightly spicy finish. Plus at around $10 - it is a bargain. But don't just take our word - the wine won a Gold medal at the 2003 CATAD’OR, Argentina's most famous wine competition. 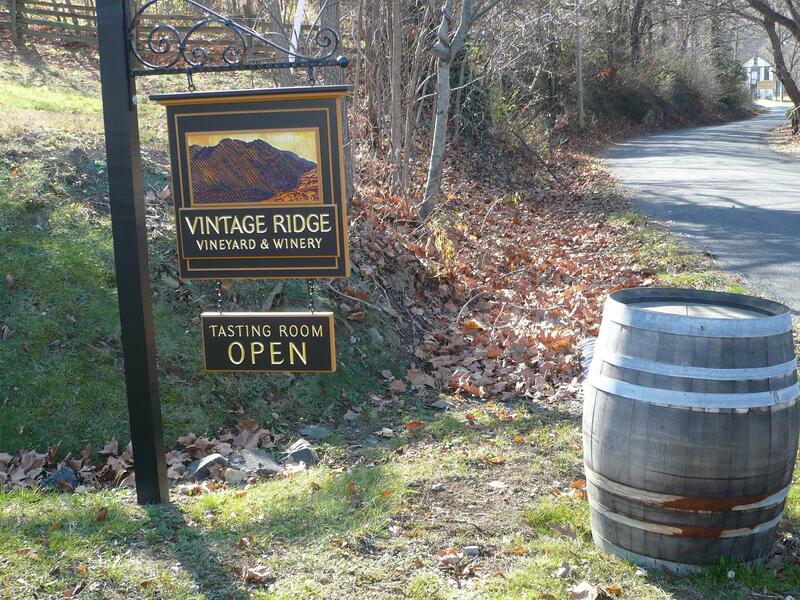 Last Saturday we visited one of Fauquier County's newest wineries, Vintage Ridge Vineyards. The winery is located in the historic village of Rectortown, which still contains many 100 + year old houses - and was where General McClellan was camped when relieved as commander of the Army of the Potomac. The vineyards are hidden from the main road; but once you drive up the driveway the estate opens into an array of vines surrounded by woods and views of the Blueridge Mountains. An amazing site. I am constantly surprised when new wineries produce quality wines in their first vintages, and Vintage Ridge Vineyards is no exception. They started by planting vines of two grapes that grow extremely well in Virginia: Cabernet Franc and Vidal Blanc. Plus, they added a little character by growing Mourvedre. Thus all their wines are estate grown, except for a Syrah where the grapes are grown in another Fauquier County vineyard. Vintage Ridge has a very unique method for serving their wines. Visitors can purchase a tasting platter containing meats and cheeses as well as access to a variety of mustard and chutneys. The tasting sheet offers suggestions for pairing the wine with specific meats, cheeses, or spreads. The winery wants visitors to appreciate how a wine's flavor changes when combined with different foods - plus it makes the tasting experience a lot more entertaining. The first wine was a dry vidal - the Summer Night (dry) - which has a nice floral aroma and dry fruity finish. I preferred the next wine, the Maiden Voyage, a blend of Vidal and Mourvedre. This is your refreshing afternoon wine after a day of work - smooth with a refreshing acidic finish. Moving to the sweeter whites, Vintage Ridge produces a second Summer Night, this one with 1.5% RS. This is an alternative to a semi-dry Riesling. And then there's the Ice-wine styled Late Harvest Vidal Blanc - made from grapes frozen after harvest. This is the wine to have the most fun tasting with chocolate, the chutneys, and even spicy mustard. 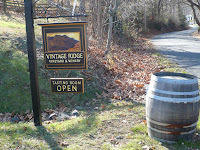 Turning to reds, Vintage Ridge poured two excellent wines from Cabernet Franc that show why this grape is special in Virginia. The 2005 Cabernet Franc was aged one year in the barrel and is a full bodied spicy wine. Spicy from the initial aroma to the "tail". The 2006 Cabernet Franc is smoother and more complex - more reminiscent of a Bordeaux styled wine. Both are completely different - but excellent in their own styles. The final wine was a Syrah - but after the Cabernet Franc - my attention span was wavering - so any thoughts would not give this wine justice. Next time, I'll try this wine first. If I can't return to the winery before Christmas, I look forward to my next visit in the spring. Plan ahead and give yourself ample time to try the wines and food - I plan to spend an afternoon.